Being a woman in medicine is not as difficult today as it was for our predecessors, but I'd venture to say that we still haven't gained true equality. My medical school class was the first class in school history to have an equal number of male and female students. The classes that followed ours actually were weighted in favor of more women than men. Yet, as I roam the halls of my hospital, I am acutely aware of how much of a "boy's club" still exists. There are small reminders in the physician's lounge areas of the surgical suites. The lounge attached to the female locker room is the "nurse's lounge." The lounge attached to the male locker room is the "doctor's lounge." In the hospital's general "doctor's lounge" there is a single restroom, in which the toilet seat is always left up. In the operating room, invariably, it is my rooms that get the fresh new scrub techs that don't know a Kelly from a Heaney clamp, because they don't want to tick the male doctors off. My rooms also tend to run farther behind, "because (I) don't throw a fit." I'm sorry, since when was "throwing a fit" acceptable professional behavior? It happens more often than it should. The reminders extend to the floor, as I round on my patients. At times I have to search high and low just to find the nurse that is taking care of my patient. I see my male colleagues, without lifting a finger, get a nurse to round with them. No kidding, these nurses, with whom I have a very good rapport and professional relationship, will snap to attention, grab the physician's charts, and follow them on rounds writing verbal orders as they go. Boggles the mind. I am friendly with the nurses, but in high stress times, I tend to bark orders just like any other physician. I have been called out for being "too harsh" in certain circumstances, and made to sit down with the nurse in question to apologize. I tread very carefully in my tone of voice, in order to not be misconstrued. In contrast, there was an incident in which a male physician grabbed a nurse and *shook* her because she did not complete an order that he requested (in the best interest of the patient.) Today that doctor and that nurse were laughing and joking together like it never happened. I have to wonder if I would even be working if I had dared pull such a stunt. In the office, the fun continues, as my front office staff gives me hell for cancelling patients for a delivery, but will turn around in a heartbeat and croon "Aw, poor OtherDoc (my male colleague) has to go for a delivery. Of course we'll take care of it!" When the office orders lunch, they serve it to him in his office! You know, because he has "important doctor stuff to do!" Not to mention the varied and sundry insults that seem to happen on a daily basis. Patients that call me "sweetie" instead of *Dr.* Whoo or refer to me as "that nurse right there." Office patients that insist on calling me by my first name (which I never gave to them). The visitors that come up to me at the desk while I am working on charts to ask me to go fetch them some ice. This never happens to my male colleagues. It just doesn't. We've all covered, in detail, how the difficulties extend into our home lives as we struggle to wear the mother, wife, and physician hats simultaneously. Women in medicine may have come a long way (baby), but from where I stand, we are the Thursday's children of medicine. We have far to go. I watched The Nanny Diaries a few days ago. I really hate when stupid movies make me cry, but I couldn't help but shed a few tears when the child runs to the nanny for comfort instead of his own mother. Kind of struck close to home. Of course, I'm not much like the upper east side moms in the movie who don't work but have a live-in nanny. I have a nanny because my husband and I both work full time. But that doesn't mean I don't feel guilty about leaving my daughter every day. Or become paranoid that she likes the nanny more than she likes me. We used to joke around that Melly liked our nanny best, then me, then my husband. I returned to work from my maternity leave when Melly wasn't even two months old. I was forced to trust a complete stranger to watch my infant every day while I went to work. It all felt so pointless. Why did I have a child if I was just going to abandon her every day? This wasn't the way it was supposed to be. The nanny was part of the reason I clung to breastfeeding as long as I did, even though my work didn't really allow me time to pump. I figured that was the one thing that only I could do for her. As time passed, it became easier to leave my daughter every day. And thank goodness, Melly strongly prefers her parents to her nanny. (Even though our nanny is wonderful.) She cries when I leave but not when the nanny leaves. Still, I can't help but feel a lot of guilt that someone is raising my child besides her mother. Are you a better doc because you have kids? As a pediatrician, I am asked this quite often. By students, by patients, by patients' families, by trainees, by colleagues, by neighbors... I try to answer sincerely, but since I resist the notion that one isn't as good at being a pediatrician before having kids, I don't want to fallback on the easy answer that I'm "better" at it now that I have two darlings myself (having experienced breastfeeding, nursemaids elbow, sleep associations, febrile UTI, and the like). In some ways, because I want to rush home promptly if not early from work to be with my kids, and arrive late to work periodically when I practically never did so before I had kids, maybe (for these and other reasons) I'm worse! When asked, what do you say? A few months ago the UK government's science and technology think tank Foresight concluded its Project on Mental Capital and Wellbeing. 1. Connect with other people, be they family, friends, colleagues or neighbours. 2. Be active. Go for a run, walk around the block after dinner, putter in the garden or take the kids sledding. 3. Take notice. Be aware of the details of daily life - the beautiful, the humorous, the surprising. Be conscious of the world around you and your reactions to it. 4. Keep learning. Take a photography course. Learn to knit. Tackle a work problem in a different way. 5. Give. Show kindness to others. Volunteer. Support a charity. Donate blood. The report, the result of a two year study involving over 400 international experts, concludes that making these five activities a part of daily life can have a profound impact on people's happiness. These recommendations crystallized a few things for me. First, they offer an explanation for why a day at the clinic is almost always extremely satisfying, whereas a day at home with the kids must be carefully crafted to provide close to the same level of happiness. I'm not talking about long-term gratification or blissful moments, where at-home mothering easily holds its own. I'm referring to my state of mind at dinner time, when I review the day. Medicine has an advantage in that it inherently ensures that I connect with colleagues and patients, take notice of the details of others' lives, learn continuously and give to others. I tick off four of those five boxes just by going through my day. I check off all five when I hunt for free parking and walk eight blocks to the clinic. Staying home with the kids, few of those five activities occur spontaneously. When the path of least resistance is followed, a length of time at home seems to naturally tend towards isolation, inactivity, monotony and boredom. Most of my days at home are pleasant ones, but only because of the work I put into making them so. Scavenging in the woods, photographing ruddy cheeks and muddy boots at the beach and meeting up with friends for afternoon tea at Honey's Doughnuts make for good days, but require concerted effort on my part. Second, the list validates the time I take during the day for pleasurable pursuits. Knitting while the kids nap, bringing The Element of Lavishness along to the beach and fiddling with a setting on my camera during lunch are often accompanied by some guilty twinges. Shouldn't every moment with my children be devoted to them? And any spare ones be spent reading Parkhurst Exchange? But I see that all of my hobbies include several of the five happiness-inducing habits: photography involves learning and taking notice; writing requires taking notice, connecting with others and learning; and gardening entails being active, learning and taking notice. Now I can articulate why tucking away pockets of time for these activities during the day is not frivolous: it may quite literally preserve my sanity. What do you do when you get a day off? I always imagine that families in which the mother isn't working weekends are always up to some great adventure. Taking the kids to the petting zoo, or picking berries on the farm, or just inventing clever games at home. You know what I want to do when I finally get a day off? Not a damn thing. I don't *want* to do anything. I want to sit. I want to veg out with a book or movies or my laptop. I don't want an itinerary or an adventure. I just want to be. So of course, then I feel incredibly guilty. Here I get a precious few hours with my darling children, who are growing up faster than I can believe, and I don't want to *do* anything with them. How are my children going to remember me? Mommy, finally home from work, lying listlessly on the couch, book in one hand, computer near the other? This isn't how I want to be remembered. When I try to go and do kid-friendly activities, I find myself incredibly short tempered and longing for the comfort of home. I know that 4 days off a month is just too little down time, and things will get better once my job situation changes. In the meantime, what do you do with your little ones when you have the time to spend? Any suggestions for low key activities for 5 year olds and 18 month olds? I want to start making some good memories for my kids that don't involve the movie theater. Thank you in advance! A lump began to rise in my throat. “Well. Ummm. I’m not sure” I stammered. We haven’t really discussed it. The truth is that two years ago when we started this adoption journey, I would have never dreamed it would have taken this long. We both assumed we’d have a toddler by now. Our son has albinism. It is autosomal recessive genetic disorder. Our son is beyond amazing and is barely effected by the condition, however we know that a majority of people with albinism will be significantly visually impaired. When we decided to grow our family, domestic adoption was the path that seemed right for us. It was exciting at first. We told everyone we knew about our journey, for their prayers and support. Additionally, the books (I’ve read many) suggested to network in case friends/ family knew a potential birthmom. We took classes and filled out paperwork it was a tendious process but at least we were “doing “something. We were a year into the process when we met our first birthmom. Things were amazing. We were so excited we could hardly stand it. We knew we should be cautious, but things seemed so certain. Then days before delivery things fell through not because she changed her mind, but because of a strange legal glitch. We were devastated and left staring at an empty nursery. The irony being that I deliver babies. Constantly. This of course confuses boywonder. For awhile after the first adoption fell through, he would ask when I went for delivery if “it was our baby” I was delivering. No, not yet. And my heart would break just a little but every time he’d say it. He rarely says it now. So much time has passed. It’s also getting challenging to deal with all the follow up questions from the “zillion” people we’ve told. At work its hard to be sympathetic to the patients who get upset about an unplanned pregnancy. The worst is people who get seriously upset about the gender of their baby. Honestly, I’ve never been able to muster much sympathy for them. I know that the process has given me a new depth of empathy for my infertilty patients and others going through challeging situations. I’ve labeled this post adoption Journey Part I as a statement of faith that someday (hopefully soon) I will proudly post adoption Journey part II where I will post pictures of my beautiful child. Until then thanks for letting me vent. I’m also thankful to fat doctor for sharing her successful adoption story and being so transparent through her process. I smiled at him. “Why, yes I do!” Four is not age appropriate for methods of birth control. We’ll get there, don’t worry. Besides, why spoil his fun? I was laughing so hard I could hardly drive by this point. “Mommy,” he said, seriously. “I want a pogo stick when I’m a big kid.” Oh, you may get one, Z, but it will probably be a little different than the one daddy bounces on currently. Today Z and I were talked about how he misheard something I had asked him to do. I said “I think it’s because you have elephants in your ears,” borrowing a joke from his pediatrician. My kids' preschool teacher, Miss Amelia, is the kind of mom dreams are made of. She has 4 kids ranging in age from 2 to 10, all of whom are being homeschooled and come with her when she teaches two mornings a week. She lives 2 hrs away in the country but somehow manages to get herself and 4 kids ready and make the drive to school to receive her class of 8 preschoolers at 9:30am on the dot. She is never late. Her 4 kids always have creative, healthy, homemade lunches. They are intelligent, respectful, cooperative, helpful...miraculous. Her 10 year old daughter oozes patience and sweetness and wisdom beyond her years. One morning, my 4 yr old son got out of the car and immediately started wailing because he had forgotten to bring anything for show and tell. My systolic pressure shot up by about 20 points as I tried to figure out how I could end this scene without driving all 3 kids back home to retrieve a dinosaur from our living room. Meanwhile, the 10 year old sweetly said, "I'm sure we have something in our class treasure box you could use for show and tell. Would you like to look in the treasure box? Ok, it will be our secret, but only if you stop crying..." As he wiped his eyes and wandered off with her, walking on a cloud, I stared in amazement. She is her mother's daughter. A few days later, I decided to take stock of how I was doing as a mom by sitting back and observing my own kids' behavior. Unfortunately, in the span of an afternoon, I heard my 5 yr old son telling my 3 yr old daughter, "I am closing my eyes and counting to 10. If ALL of those toys I just cleaned up aren't back in the toy box again when I open my eyes, we are not going to California next month..." or worse, my 3 yr old telling her teddy bear, "No, I can't play right now. The house is a mess, and I am busy!" with a familiar tone of irritation. Yikes! I think this reap what you sow business is the real deal. This past weekend, I came down with a terrible cold. My kids had a friends' birthday party to attend. They had been looking forward to it all week. As I sat there coughing and feverish on the couch, I had to tell them I couldn't take them to the party because I didn't want to get all of the party guests sick. I braced myself and prepared for the fallout--here come the tantrums, I thought. They looked at each other, then walked out of the room silently. Two minutes later, they reappeared. My 5 yr old son was lugging a huge flannel quilt and a cup of water, and my 3 yr old daughter came bearing her favorite stuffed animal and her blankie. Together they worked, their tiny faces concerned but reassuring, their body language unhurried, gentle, and kind, to wrap me in the king-size quilt. My daughter put her bear and her blankie under my chin, and my son pulled the coffee table a little closer so that I could reach the cup of water without having to get up. Then before going off to play quietly with her brother, my daughter kissed my hot forehead and said, "Shhhh, I love you. You'll feel better soon." And she was right. I did feel better. For all my shortcomings as a mother, and there are many, I am teaching my kids by example to be healers, at work and at home. For that, I am grateful. My daughter is 3 1/2 and we're having fun exploring children's books, now that she can actually appreciate the written word. We have successfully graduated from books-as-teethers, books-for-shredding, and books-for-rapid-page-turning. It's also much more enjoyable for me as the reader since I'm not as often bored out of my gourd. We have a couple of doctor-themed books in our house, hoping to give her a better idea of what mama does when she goes to "work." The books are okay, but rather uninspired. Yes, they have protagonists who are doctors, but that's about it. Neither she nor I is excited to read either of them. But, then we found Doctor Ted by Andrea Beaty and Pascal Lemaitre. It is adorable. Funny. A great cadence to read aloud. Well-illustrated. It has quickly become one of Jolie's (and my) favorites. 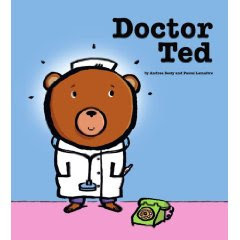 Ted is a bear who wakes up, bumps his knee, and decides he needs a doctor. In the absence of finding one, he becomes one. The story follows his adventures of doctoring the people around him at school and at home, brilliant diagnoses included. His mother was in the kitchen. *I received no compensation for this! I just adore this book and thought other Mothers in Medicine might too. One of my jobs as doctor is to hold the head of a spinal cord injured patient while X-rays are being taken with their neck brace off. Nobody else can do this job but the MD. Holding a patient's head in place during X-rays takes all my cumulative eight years of medical knowledge. My attending is super nice and when I told her I had been doing this yesterday, she commented, "Oh no! But you could be pregnant!" "Uh, no," I said. "I couldn't." She contemplated this for a moment, then asked, "Well, why not?" I'm not sure why it's so shocking that I wouldn't want to be a resident with two babies. I don't hate sleeping that much. Do I look too relaxed? During my first few months of motherhood, I couldn't imagine how ANYONE would EVER even consider having a second child. Every time I put on my non-maternity clothes, I cried with joy. But now, almost two years later, I feel the baby fever starting up again. Babiez r cute. So tiny and helpless. And breastfeeding was such a good way to lose weight. And there's peer pressure. Tremendous peer pressure. Everyone seems to be having their babies two years apart. That way, the babies can be friends? All the women I know who were pregnant when I was are now pregnant again. Now is the time. Everyone is doing it! My frontal lobe is still in charge for the time being. I love the fact that my daughter sleeps through the night and is more interactive and fun. I love that I still get to have some time to myself. If I had another newborn, my life would get crazy again. They say that a second child quadruples your work. If I were pregnant, I'd probably be too fatigued to be as good a mom as I want to be. And I'm not even 30 yet, so theoretically I've got a little time left on the old biological clock. In the meantime, I've got to get myself a niece or nephew or something. A newborn that I can cuddle with for a short time then give him back. The request for reading suggestions got me to thinking about the problem of finding time for adult pleasures when life is filled with work and children. Although we see plenty of people in our work settings, that is different from having friends. We are necessarily reserved with patients, and we tend to be (or struggle not to be) competitive with colleagues and directive with staff. It takes a conscious effort for working mothers of any stripe to maintain or seek friendships. On the one hand, our children’s activities bring us together with parents of children of similar ages. Some of the best friends I have made as an adult are women I met that way: in a prenatal exercise class and the mothers of my daughters’ close friends. Even the girl scouts have provided some great connections (though with continual dodging and weaving to avoid being the cookie mom). But it is not always easy to find common ground outside of parenting, and when children change their friends or their activities, these ties can easily fray. I have tried lots of other ways, including book clubs (but then you have to read the books), exercise classes (never a good bet for an unathletic soul like me) and various volunteer activities. What has worked best—and sometimes wonderfully—has been to get involved with things I love for their own sake, to which I can bring a child sometimes. The real lifesaver was finding an opera company that had chorus parts for adults and children. I brought along two of my daughters, and while I never graduated above second alto, the experience brought out my daughter’s latent musicality and has formed her career as an adult. It is important to find something that is more than a single time event, that offers both continuity and flexibility. The Sierra Club, with its multiple local outings, can be great for that. The other thing I have learned is that with effort, one can learn not to strive for excellence in everything. We have been such achievers, it can be a surprise to realize that a fifth rate production of one act plays is still fun and that other harried but interesting people may be drawn to similar things. And of course, my lifelong addiction to books with series characters—from Nancy Drew to Harry Potter and mystery series too numerous to mention—means that whenever I want to visit an old friend, someone completely undemanding is always at hand. Do others think about this? How do you stay yourself while taking care of so many other people?